Trawsfynydd Holiday Village has some great offers on this February half term. Spend the day exploring Snowdonia’s mountains, beaches and tourist attractions and then curl up at night in one of their cosy cabins. Coed y Brenin biking centre is only 2 miles away. You can also get 15% off with Snowdonia Adventure Activities, 10% off at Zip World Titan, 10% off at Tree Top Adventures & 10% off White Water Rafting when booked through the Holiday Village. Trawsfynydd Holiday Village now offers pet friendly cabins in 2015 with pets charged at £5 per pet per night (2 pets per cabin). 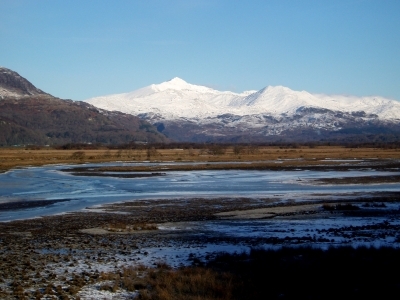 February Half Term Holidays in Snowdonia – Short Breaks in our North Wales Accommodation. LARKHILL TIPIS WEST WALES: Escape to Carmarthenshire, West Wales this winter for a luxurious child-friendly, sustainable camping experience. Larkhill Tipis offers five different nomadic camping experiences with three of these available over the winter months. Accommodation includes the Alachigh a luxury tent originating from Northern Iran and two yurts. Stay warm with a woodburning stove, sheepskins, big cushions, pillows and plenty of blankets, beautiful rugs, lanterns and comfortable beds. What to do: In the grounds there is a woodland park with swings and a slide. Located half an hour from Cardigan Bay’s coastline with sandy beaches plus horse riding, fishing, go karts, a butterfly farm, steam railways, castles and museums in the surrounding area. Nightly rates start from £70. www.larkhilltipis.co.uk. THE BIVOUAC: if you are looking for a totally unique escape then this is it. The Bivouac located in the Yorkshire Dales offers luxurious, rustic and sustainable off grid accommodation. 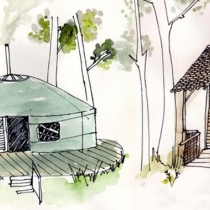 During the winter months you can stay in a hand crafted, round-wood timber frame woodland shack (from 5 Feb) or in the Bunk Barn; year round you can also choose to stay in a canvas Yurt burrowed into the hillside. Inside the Shack there are handmade and up-cycled items furnishings providing a snug setting. Windy Smithy wood burners are fitted with a range attached for heating, cooking and warm water. Please note there is no electricity. A four night stay for a family of four starts from £410. Log-Cabins, Eco-Lodges, Yurts, Glamping & Bunk Barn Accommodation in Masham | The Bivouac. CAALM CAMPING DORSET: Open all year round Caalm Camping has six traditional hand painted Mongolian Yurts. 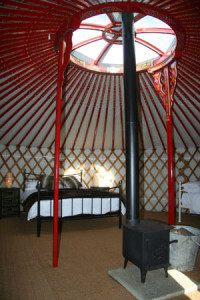 The yurts sleep up to six and a travel cot can be provided on request. Their location makes this is a great base for exploring Dorset, Somerset and Wiltshire just one hour from the M4 and M5. Children can scramble about on the wooden play equipment, get closer to the wildlife (regular deer, rabbits and pheasants are visitors) and the area is fenced in and safe for children to play. A four night stay in February is £250 for up to 6 people. Free wood is provided for the wood burning stove. Electric sockets are provided. yurts dorset, luxury yurt camping holidays uk, glamping holidays somerset, yurt camping dorset, farm holidays dorset, yurt camping holiday wiltshire, yurt campsite dorset, luxury camping dorset, yurt camps england. Book early and receive 15% of any 3, 4, or 7 night 2014 self catering break at Bluestone National Park Resort in Pembrokeshire. Bluestone is perfect for a family break with over 100 free range activities to choose from and with 500 acres of free countryside to explore on foot or on bike. A 15% deposit is all that is required to secure your booking and be assured that you have received Bluestone’s lowest price guarantee. Earlybird 2014 Short Break Offer – 15% Off Holidays – Bluestone Wales. Bluestone national park resort in Pembrokeshire has some great late summer offers. Bluestone is perfect for a family break with over 100 free range activities to choose from and with 500 acres of free countryside to explore on foot or on bike. Bring your own bikes or hire them as there are great cycling routes and trails through quiet country lanes leading to the coast and pretty villages. Bluestone Wales offers include a four night short break arriving on the 2 September at £525 and the 9 September at £500. There is staying Monday to Friday in Gateholm a spacious, detached three bedroom lodge with ensuite bathroom and a second bathroom. Summer 2013 Short Breaks and Holidays UK – Bluestone Wales. Children under five camp for free at Camping in the Forest’s nineteen campsites across England, Scotland and Wales. All of their sites are set in the heart of Forestry Commission land so there is plenty of family fun to be had in the woods. At selected campsites this summer, Forest Rangers have a range of fun activities planned ranging from forest survival to orienteering to ‘Dusk Watch’ and ‘Night Vision’ events. Activities vary dependent on the site so please check to see what’s on. Each site also offers miles of woodland trails that are directly accessible from your tent and many of the sites have adult and child bikes to hire including child seats and tag-alongs. Prices start from £13.30 mid season and £15.40 high season (starts 26 June in Scotland and 20 July England and Wales). Special offers on Camping in the Forest campsites – Camping in the forest. PGL has a great offer on its summer activity holidays for children and teenagers. When you book before the 4 July 2013 you can take advantage of their ‘book one child, get one free’ offer for the same holiday/week booked. This offer is across all of their 4 and 7 night multi activity holidays and nearly all of their ‘specialist’ holidays. There is a great range of specialist holidays to choose from including Xtreme Adventure, Video Games Workshop, Stage Skills, Film-making, Wellbeing, Motorsports, Cooks Academy, Adrenaline Adventure, Mission Spy, Indiana Jones, Wet & Wild, Explorer, Climbing Adventure, Learner Driving, Horse riding, Surfing, Leadership Challenge, Bushcraft, Photography Adventure, Music Studio and Street Dance. PGL has also knocked £150 off their 7 night multi-activity holidays and off many of their specialist holidays too, plus 2 French ones too!! SAVE2X is for all multi-activity holidays. PGL Adventure Holidays – More Special Offers. The Level Crossing positions itself as a bunkhouse providing family and bunk bed accommodation for up to 35 people in the market town of Llandovery in the Brecon Beacons in Wales. Private rooms are from £42 per night based on two sharing and can sleep two or three. High chairs and travel cots can be reserved. The Level Crossing is located near to Llandovery Station on the beautiful Heart of Wales Railway. On the doorstep there is beautiful scenery with nearby walking, cycling, mountain biking, fishing, canoeing as well as scenic drives, castles. gardens, forests, wild beaches and gold mines. Bike hire can be arranged. The Level Crossing is a new business with a social difference that provides employment and training opportunities to the local community. Beds :: The Level Crossing :: Bistro & Beds | Bwyty a Gwely. Bluestone welcomes you to join in their Bluestone Free Range Summer Festival. The festival offers children of all ages ‘free range’ adventures from samba drumming to coracle racing, street dancing and messy fun for the little ones. There’s even a great Carnival Parade when the youngsters can demonstrate everything they’ve learned and made. For the Bear Grylls there are woodland survival games and building dams to race rafts downstream. Bluestone is a 5* resort set within Pembrokeshire Coast National Park designed to inspire and to connect with nature. Accommodation within the Village includes luxury lodges, cottages and studios set in a hillside and around a lake. The Resort has its own restaurants, wine store, pub and spa. There is also a waterpark and adventure centre in the neighbouring valley. During the school holiday period, the best mid week break on offer is £750 (arriving 26 August for four nights). During July prices are as low as £519 (arriving 8 July) and early September is just £300 (arriving 2 September) again for a mid week break. Prices are for a lodge sleeping a family of four at Bluestone Resort. If you are looking for an unusual place to stay then you can’t get much quirkier than this – ‘Sonia’ is a 1950’s pleasure launch set on land. Sleep in a boat in its own paddock with sea views. Located near the shores of Cardigan Bay, there are walks to local beaches which are just fifteen minutes away. There is even one beach much closer (with steep access). Sonia is hugely popular and there is just one short break left this summer – a 4 night break starting the 1st July 2013 will cost £320. This quirky accommodation is suitable for 2 adults and 2 children (the padded seating bench converts into 2 narrow sleeping beds for the children). There is a woodburner, kitchen, shower room and all the comforts you would normally expect in the converted little barn next door. Dolphin and seal watching trips are available in the local area. Infants are not allowed – only children aged 2 and over. Sleeps 6, Close to Llangrannog beach, Cardigan Bay. This is the perfect residential holiday for your pony mad child to learn horse riding skills as well as getting to grips with how to care for the horse. Perfect for those children who have very little experience of riding.The experience includes six half days of equestrian activities and six half days of multi activity. If your child is already confident cantering then the Powys riding holidays are the perfect choice with its six full days of equestrian activities. The cost is £619 and there are two different age groups: 7 to 10s and 10 to 13s. The holiday runs during the summer months and already there are only a few spaces left on some of the Centre dates. In Shropshire the emphasis is on school-based riding and instruction whilst at the Isle of Wight and Powys there will be off-site trekking. Also available at the Lincolnshire PGL centre.